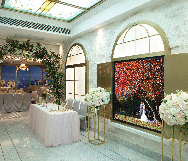 Victoria Harbour Supreme at One Peking is a wedding reception brand under the Victoria Harbour Restaurant Group (Hong Kong). 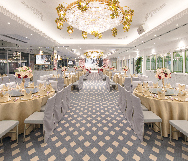 The 35-table venue speaks of prestige with fashion and romantic design elements set against the 180-degree breathtaking views of Victoria Harbour. Large HD LED screens, advanced audio-visual and lighting equipment have been equipped to deliver various stage effects. Overseen by experienced chefs, the wedding banquet menus offer amazing dishes of color, aroma and taste meticulously prepared with selected ingredients. A senior wedding service team is readily available to make wedding arrangements down to the last detail to present a luxury, on-trend and decent feast as well as create an extraordinary perfect wedding.